With a clever name that does capture the spirit of the place, Crowbar is in fact, a bar. However, there is much more than balanced tasty cocktails to be found here. Beyond the beverages we find a one-man show in the kitchen, Chef Justin Ell. One could call him the mad scientist of chefs due to his background, but also the risks he takes with his creations. I've been waiting to try the place out, yet I needed some adventurous dining mates as there is offal on the menu. I ultimately did find these people in Maggi, Kristina, David and Hanson. Upon perusing the menu, there was no doubt we would be tackling the $60.00 tasting... in addition to 2 orders of their off-menu burger! 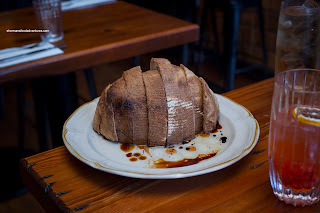 More on that later, as we began with the house-baked Farro Honey Bread with shallot oil and black vinegar. So this was just bread, but oh was it tasty bread. Beyond the chewy and firmly crunchy exterior, the bread was soft and fluffy with a muted sweetness. Aromatic and impactful, the shallot oil was beautifully married with the robust sweet and tangy vinegar. Addictive to say the least. I could dip my shoe into that and eat it. 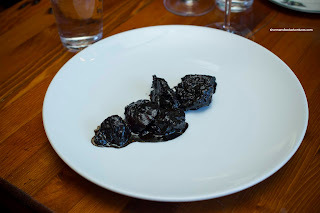 Not particularly pleasant to the eyes, the Roasted Beets with cuttlefish ink and guajillo ate much better than it appeared. Tender and sweet, the beets were also smoky and lightly earthy. Other flavours that were present included tang, saltiness and spice. These were evenly layered with different tastes as we chewed. 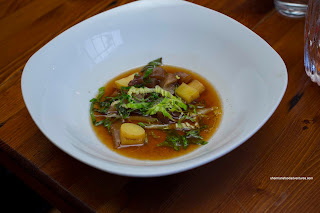 We were each presented with bowl of Smoked and Braised Pork Tendon in hot and sour broth with confit potatoes and celtuce. As much as the description of hot and sour often elicits thoughts of strong flavours, this was actually a very delicate dish. As such, the broth was only light tangy and barely sweet. Tendons were perfectly tender retaining a bite while the relatively firm potatoes were a nice counterbalance. Nice touch to add the celtuce on top at the last minute as they retained their crunch and brightness where some of them cooked slightly in the broth. 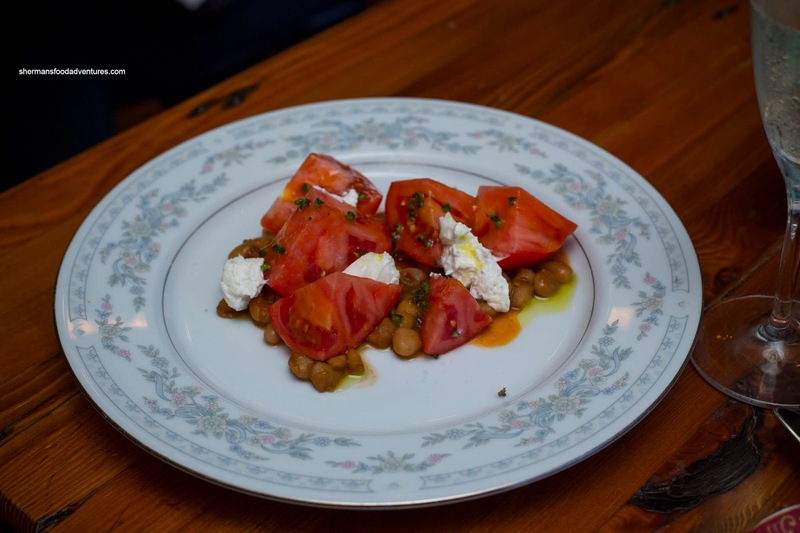 Sporting stunning ingredients, the Heirloom Tomato Salad featured cannellini beans, wild boar nduja, Domenica Fiore olive oil, burrata and herbs. I'm normally not a huge fan of tomato salads, but this was flavourful enough to win me over. The tomatoes were sweet and juicy while dressed with peppery floral oil accented by acidity and spice. Creaminess from the burrata and depth from the beans made this "meaty". 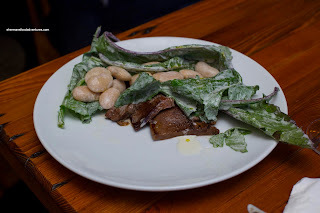 I was really looking forward to the Milk Braised Beef Tongue because if you didn't know by now, I love tongue! This tongue here was seared and accompanied by gigande beans and turnip greens in a beef fat vinaigrette. I've made beef tongue at home on my occasions and really, it isn't difficult to prepare. However, to make it more interesting than merely braising it and then searing it can be challenge. Pairing it with earthy sharp greens coated in a creamy and tangy dressing made the dish even more rich. I guess the greens was the light part of the concoction? Oh and the large beans were tender with a minor firmness. Delicious. 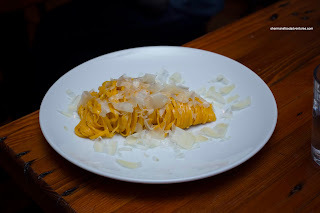 Our made-to-order Dealer's Choice Pasta consisted of Cheese Tajarin. As expected, the pasta was extremely eggy while retaining an appealing chew. It was delicate, but completely cheesy with a yummy saltiness. Super impactful while being refined at the same time. Onto some serious meat action, we were presented with the Smoked Bone-In 18 oz. Pork Belly glazed in Korean hyssop and squid ink. The large pork belly was definitely smoky, but the sauce was not our favourite. It was sweet with a slight tang, but due to the richness of the pork belly, it could've used more acidity. As for the belly itself, the meat was tender and melted-in-my-mouth while the fat was gelatinized. Probably the best part was the meat attached to the bone as it was tender and full-flavoured. Okay, behold! Look at the Whole Roast Duck! 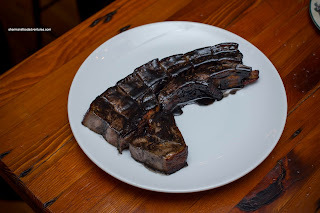 This gigantic thing was dark soy-brined and aged so the meat was succulent and well-seasoned. It was tender, but at the same time, had a meaty chewiness to it. As you can clearly see, the skin was beautifully roasted and rendered. It was crispy and super tasty. On the menu, it is $120.00 alone, but my word, it is worth it! On the side, the duck included Duck Heart Sticky Rice (or a form of Lo Mei Gai). 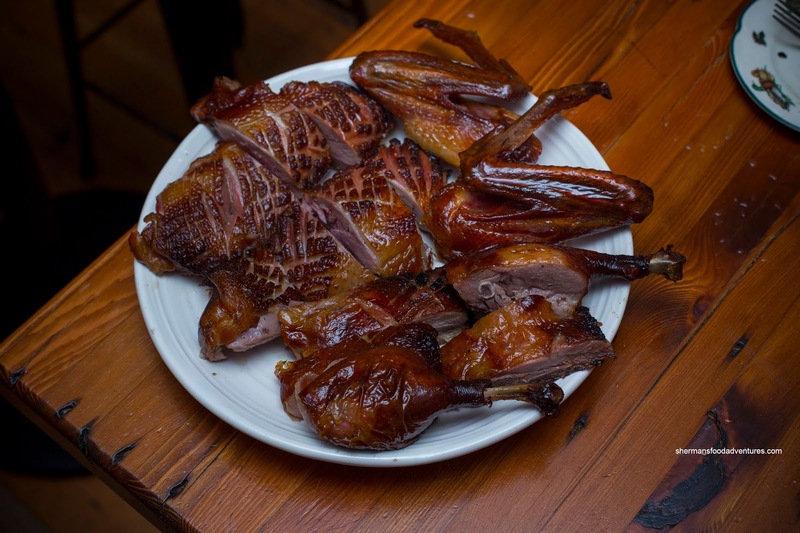 For those who are familiar with Chinese cuisine, certain roast ducks are often stuffed with sticky rice and offal. So this was a natural accompaniment in my opinion. I found the rice a little on the wetter side, but it was still appealingly sticky. Of course the little nuggets of duck heart were a nice treat as they were tender and not overdone. Remember when I mentioned their off-menu burger? 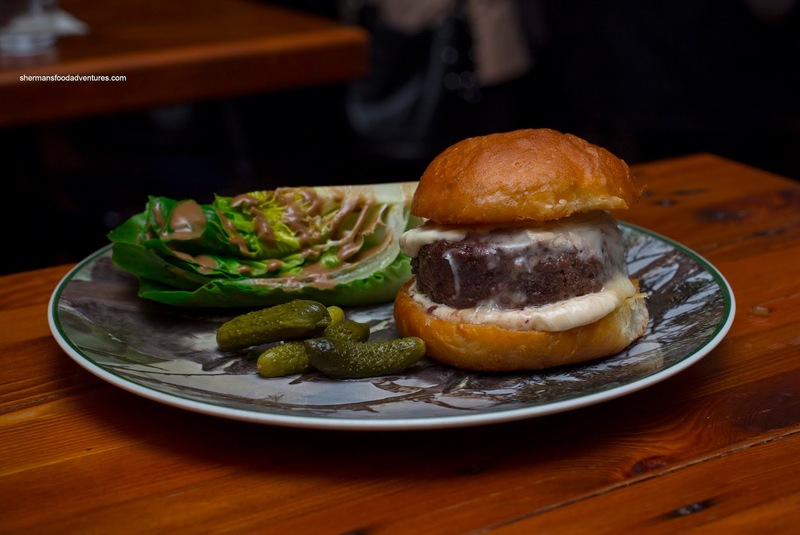 It isn't some ordinary one as it is a 67-Day Aged Burger with taleggio and beef fat mayo on house-made challah bun. Funky with a "blue cheese" sharpness, the meat was lean and fairly firm. 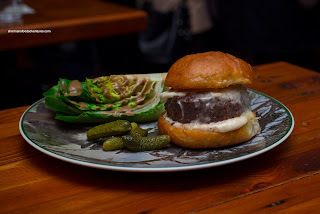 There was enough inherent flavour that the burger didn't need much else. However, the mayo and cheese did contribute more richness and nuttiness. The toast challah bun was soft with a touch of crispiness. Onto dessert, the creative use of offal didn't end there because we were served the Blood Almond Nougat with whipped sea salt espresso. Other than the colour (which looked like chocolate anyways), I really couldn't tell the nougat had blood in it. 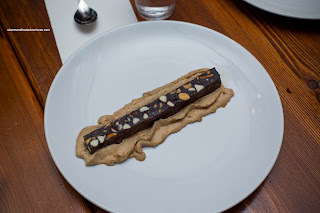 There was just enough sweetness to go with the firmly crunchy nuts and the chewy nougat. The airy whip was creamy with a light coffee taste that was elevated a bit by the salt. 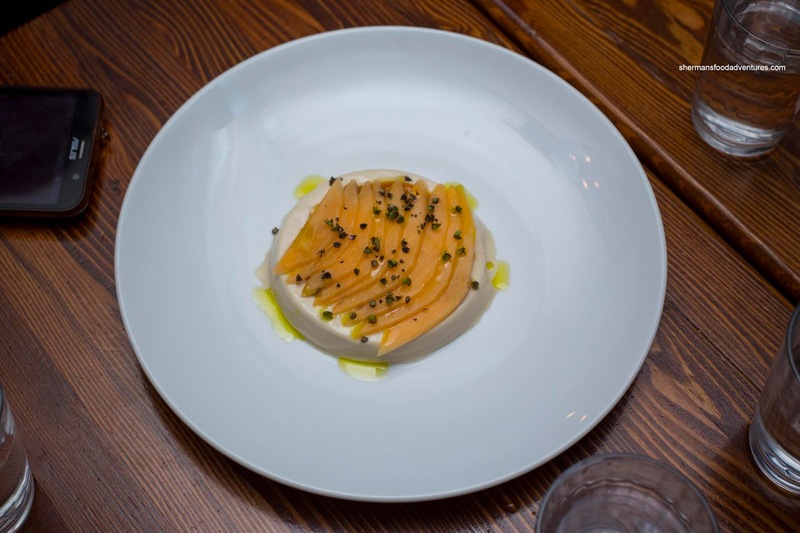 Our last dish was the Caramelized Rice Panna Cotta with Sylvia's lavender, olive oil, cashew, roasted melon and herbs. This was creamy and light with a buttery finish. 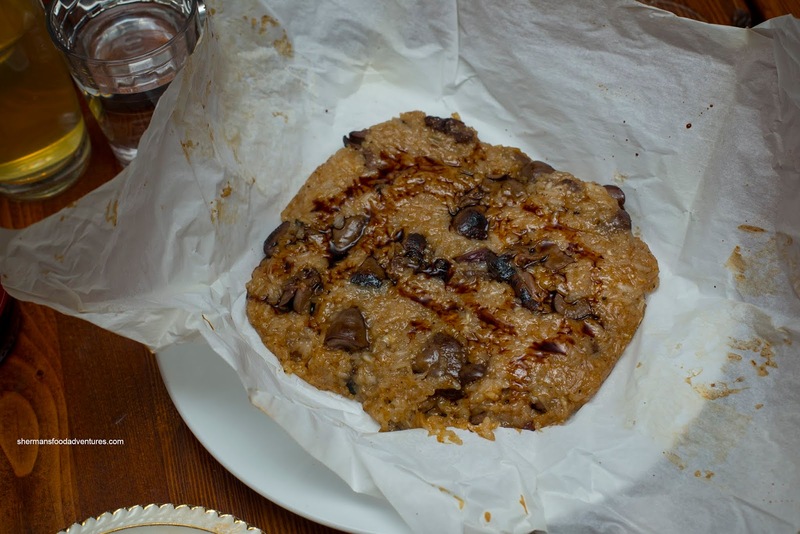 Due to the ingredients, there was a nutty sweetness as well as a bitter and spiced finish. 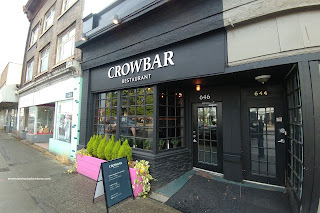 Geez, why did it take me this long to dine at Crowbar? The creativeness and originality from the chef are already great reasons to dine here. However, add in some killer dishes and tasty cocktails, it is a must-try in Vancity.